Parrotfish is the common name for members of the large family Scaridae, which live in coral reefs throughout the Caribbean as well as the Atlantic and Pacific ocean. Watch the video below. There are over 80 different species of parrotfish varying in colour and pattern even between males, females and juveniles, with each going through a variety of colour changes as they age. Colours range from blues, yellows, browns, blacks, reds, bright orange and greens. The variety in colour has made it difficult for even scientists to discern exactly between the number of different species that exist. Parrotfish are herbivores that eat plant life by chewing hard corals and digesting the encrusting algae and zooxanthellae (symbiotic algae that lives in coral polyps.) They will also eat sea grass if it is available. Parrotfish are distinctive in that their teeth form a pair of strong beak like dental plates. They also have ‘molar-like’ teeth in their throats that grind up coral so that stomach acid can digest the algae found in a around the coral. The ground up coral is later excreted by the fish in the form of sand. In this way, the parrotfish can contribute enormous amount of sediment to the sea bottom and beaches – over one ton of sand per year! Another peculiar feature of the parrotfish include certain species that secrete a sticky mucous when they rest at night, which forms a transparent cocoon around the body. It is believed that the cocoon protects the fish from predators by masking the scent of the fish. Parrotfish play an important role in the growth of coral reefs. Studies have shown when parrotfish are prevented from feeding along the area of the reef, the coral is ‘smothered’ to death by the growth of algal mats. The grazing activity of parrotfish keeps this in check. As with other reef fish, parrotfish greatly depend on the reef for food and protection. Likewise, the reef greatly depends on parrotfish to maintain its health. 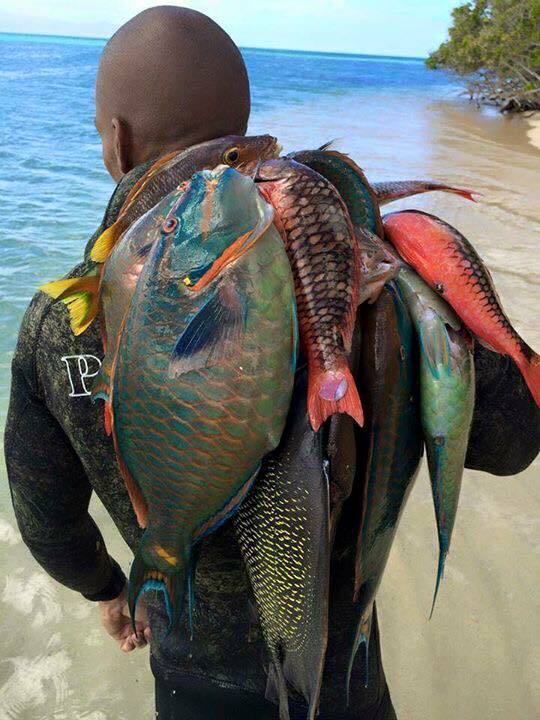 So, the next time you are about to buy parrotfish for a meal, reflect on these facts.